The presence of accessory oral cavity is very rare on review of literature, though references for teratoma and sublingual dermoid cyst and accessory tongue individually seen are plenty. The patient was a single child for the parents of non-consanguineous marriage born of normal delivery and no other problems. The reason for the presence of such an anomaly could not be drawn. 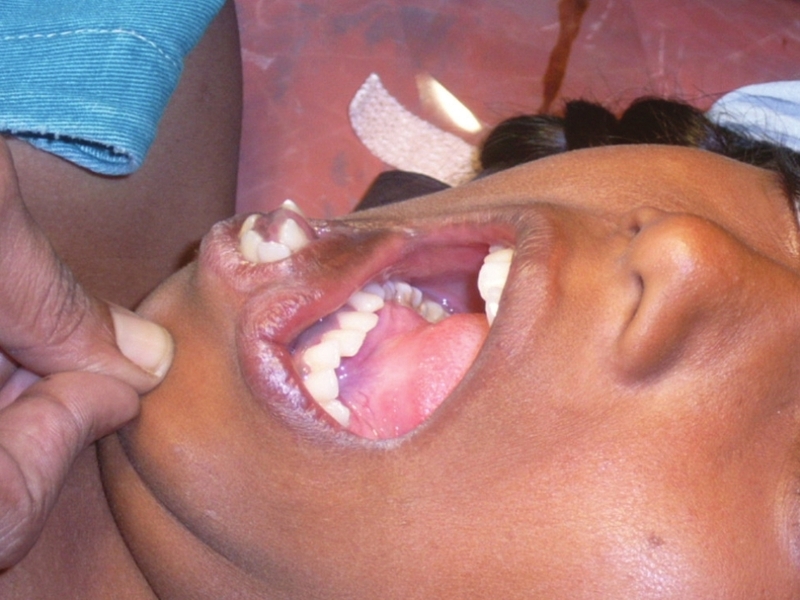 A female patient aged 11 years had reported to the hospital with her parents with complaint of presence of extra mouth since birth. They were embarrassed and had been not treated well by others in the village, thought it to be a bad omen, and came to remove it. There were no other specific problems due to the extra mouth. The patient was brushing that accessory mouth. On examination there were two oral cavities, one normal and other accessory. On extra oral examination of the normal oral cavity, the upper and lower lips were normal. The maxilla was normal. The mandible was asymmetrical due to the bony prominence. On intra oral examination the buccal and labial vestibules of the maxilla were normal. In mandible, the buccal vestibule was normal, but the depth of the labial vestibule was obliterated due to the prominent presence of the accessory oral cavity. The maxillary and mandibular posterior teeth were in normal occlusion, but the mandibular anterior teeth were present at the right side were inclined lingually, but in the left side lower anterior teeth were normally placed. The position was elevated at the right side due to the presence of the cystic lesion of the floor of the mouth, which extends from the midline to right retromolar region. But there was no disturbance in normal swallowing. The tongue movement was normal. Speech was normal. On extra oral examination, the accessory oral cavity was situated below the lower lip of the normal oral cavity on the right symphysis region. There were small upper and lower lips fused at the angle. The right angle was situated 1 cm below the right angle of the normal oral cavity and the left angle was crossing the normal midline extending ½ cm on the left symphysis region. There was skin present in between the lower lip of the normal oral cavity and the accessory upper lip. On intra oral examination in the center of the accessory oral cavity there was a bony prominence with the presence of seven lower anterior teeth with gingival attachment. The base of the bony prominence was fused with the labial surface of the mandible of normal oral cavity. There were associated right and left buccal and labial vestibules. Salivary discharge too found. The patient was not able to swallow through that accessory mouth and was able to move both the upper and lower lips of that accessory oral cavity and able to approximate both the lips of the same [Figure 1], [Figure 2] and [Figure 3]. 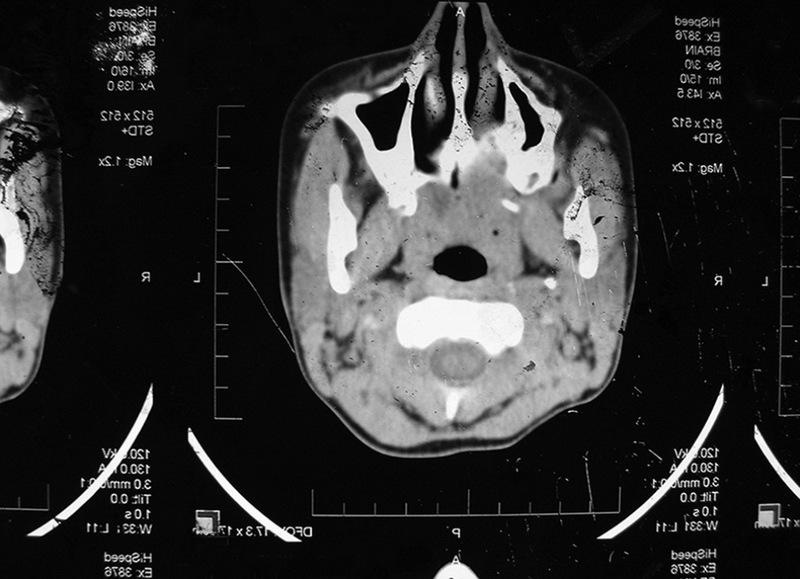 CT Examinationshows excessive growth of mandible with presence of cystic swelling and radiolucency on the lingual surface of mandible extending from the midline to right angle of mandible [Figure 4], [Figure 5], and [Figure 6]. 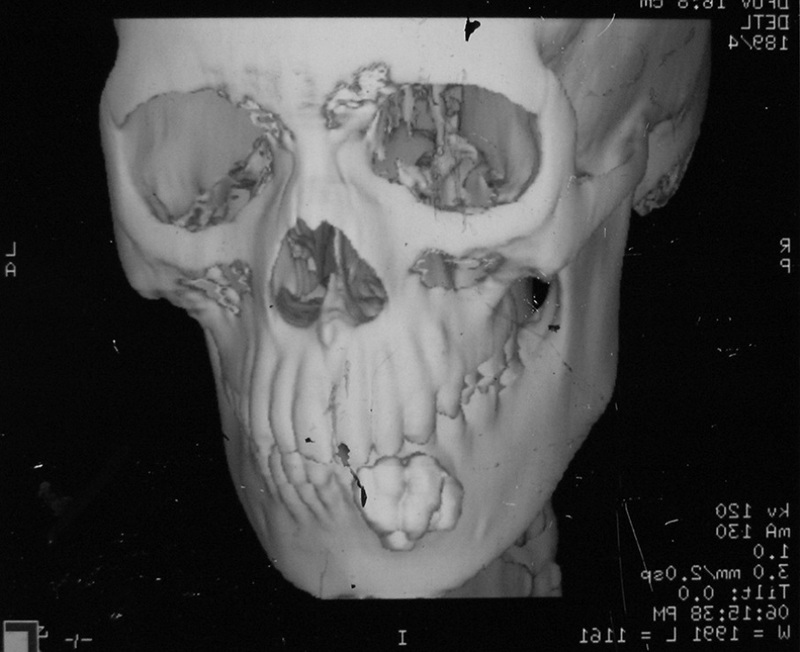 3D CT shows excessive bony growth over the labial surface of the mandible [Figure 7]. Under nasoendotracheal intubation first crevicular incision from 32 to 43 was put and labial gingiva with alveolar mucosa was reflected completely and bone exposed to lower border of mandible. During the procedure labial mucosa attached to the bony prominence over accessory mouth was incised and bony prominence was brought to normal oral cavity. There were seven teeth resembling lower permanent anterior teeth. Then excision of accessory lips was done around the vermilion border. Inside the oral cavity 41 was extracted and through that socket osteotomy done. 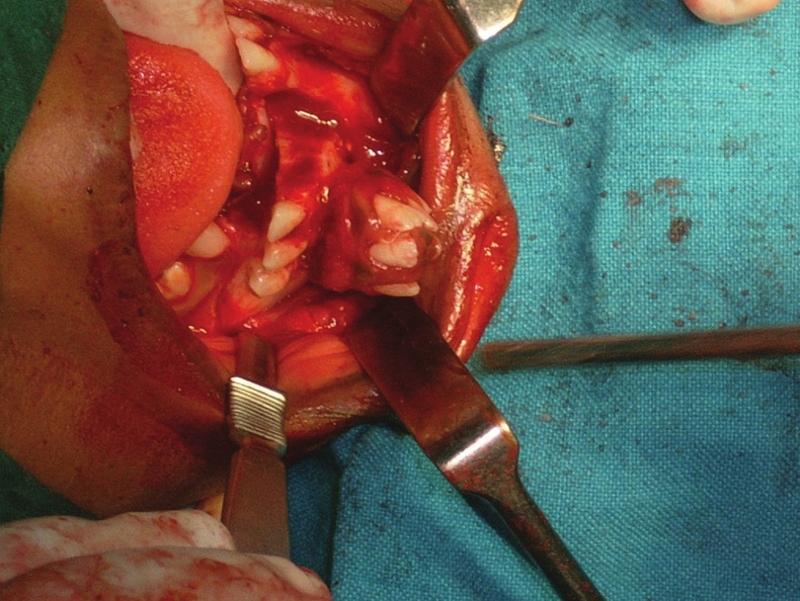 Vertical incisions were put over 41 extracted site and between 43 and 44 and horizontally connected half cm below the lower border of bony prominence of accessory mouth. The lesion was displaced lingually and mylohyoid muscle exposed and able to see dermoid cyst both below and above the mylohyoid muscle. Through the same approach excised the entire dermoid cyst. During the excision could see one small rudimentary tongue approximately 1-1/2 × 1 cm which was attached with the lining mucosa of dermoid cyst. There were multiple calcified granules and hair follicles filled with straw colored fluid. This dermoid cyst was attached on the lingual surface of the excised accessory bony prominence and there was communication from the dermoid cyst to the oral cavity. There was separate blood supply to the mouth. The excised specimen was sent for biopsy. Closure was done intraorally with 3-0 chromic catgut and normal labial lower vestibule was reconstructed. The outer skin layer was approximated with lower portion of the skin of original lower lips with 3-0 black silk. The postoperative course was uneventful and the patient went home happy [Figure 8], [Figure 9], [Figure 10], [Figure 11] and [Figure 12]. 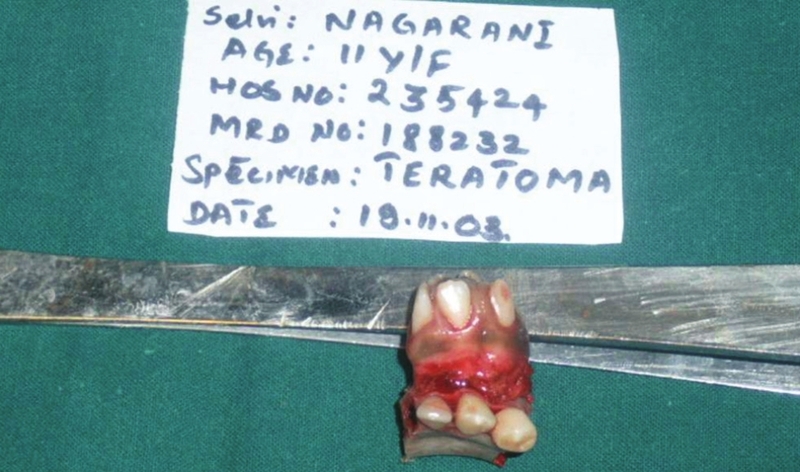 Revealed teratoma with presence of multiple small bony granules and hair follicles and teeth. The rudimentary tongue too was confirmed by the pathologist [Figure 13], [Figure 14] and [Figure 15]. Review of literature only shows teratoma, sublingual dermoid and accessory tongue as an individual entity unlike in this case where it is totally a new accessory oral cavity. 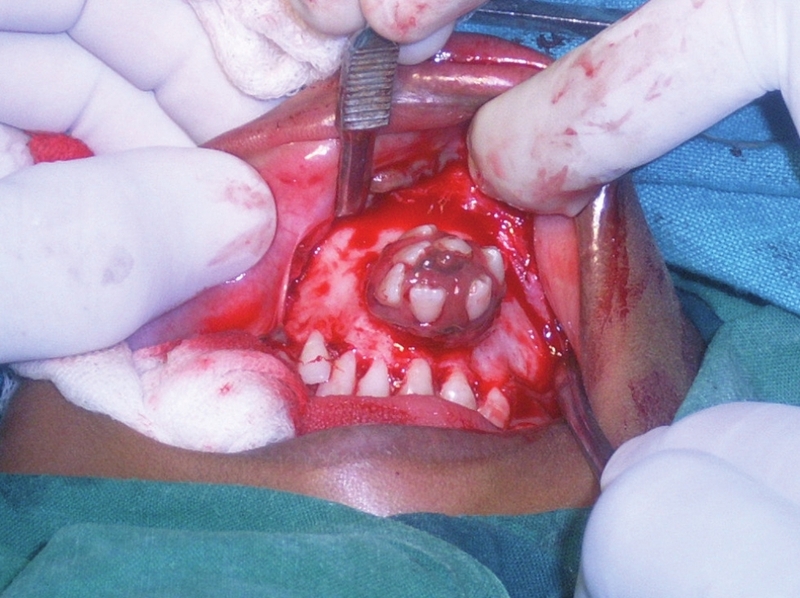 Enucleation via intraoral and/or extraoral approach is the method of treatment. This rare case was only case once reported in review of literature and hence found to be interesting and documented. 1. Al-Waheidi Em. Accessory jaw and mouth: Report of case. ASDC J Dent Child 1995;62:360-2. 2. Gulzar Ali Bukhari S, Amin M, Khurshid T, Binish, Tariq Sarfraz. 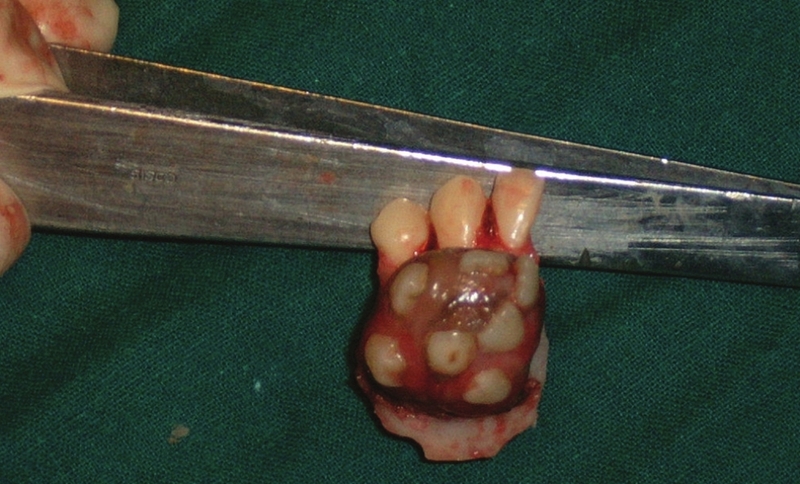 Giant oral teratoma in newborn. Pak Armed Force Jr 2008;3. 3. Gupta S, Singh S, Hasija S, Sen R. Teratoma of the tongue. J Surgl Case Reps 2012. 4. Mouth Tumor Removed From Fetus While Still In The Womb. Med News Today; 2012. Available from: http://www.medicalnewstoday.com/articles/247009.php [Last accessed date 25 Jun 2012]. 5. Shafer, Hine, Levy R. Rajendran, Sivapathasundaram: A Text Book of Oral Pathology. 6 th ed W.B.Saunders and Co; 2009. p. 69. 6. Gibson WS Jr, Fenton NA. 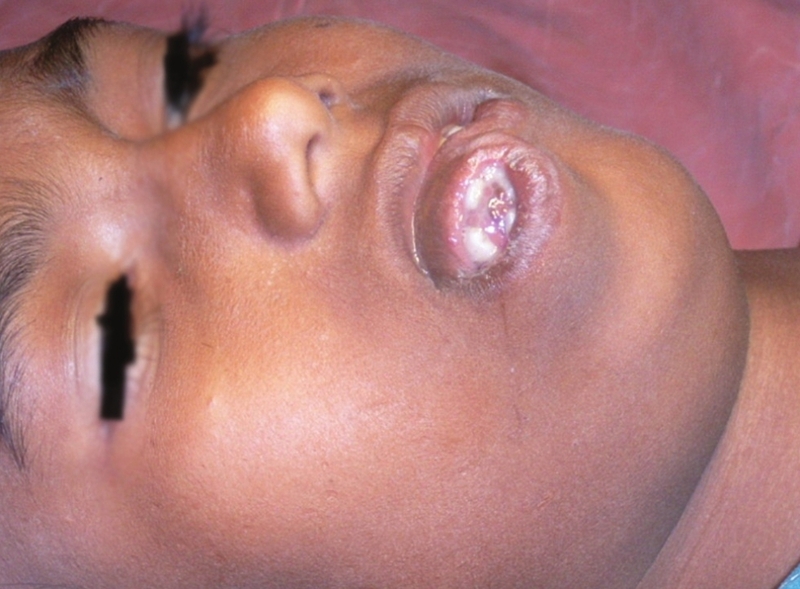 Congenital Sublingual Dermoid Cyst. Arch Otolaryngol 1982;108:745-8. 7. Makos C, Noussios G, Peios M, Gougousis S, Chouridis P. Dermoid cysts of the floor of the mouth: Two case reports. Case Rep Med 2011;2011:362170. 8. Kandogan T, Koç M, Vardar E, Selek E, Sezgin O. Sublingual epidermoid cyst: A case report. J Med Case Rep 2007;1:87. 9. De Ponte FS, Brunelli A, Marchetti E, Bottini DJ. Sublingual epidermoid cyst. J Craniofac Surg 2002;13:308-10. 10. Fuchshuber S, Grevers G, Issing WJ. 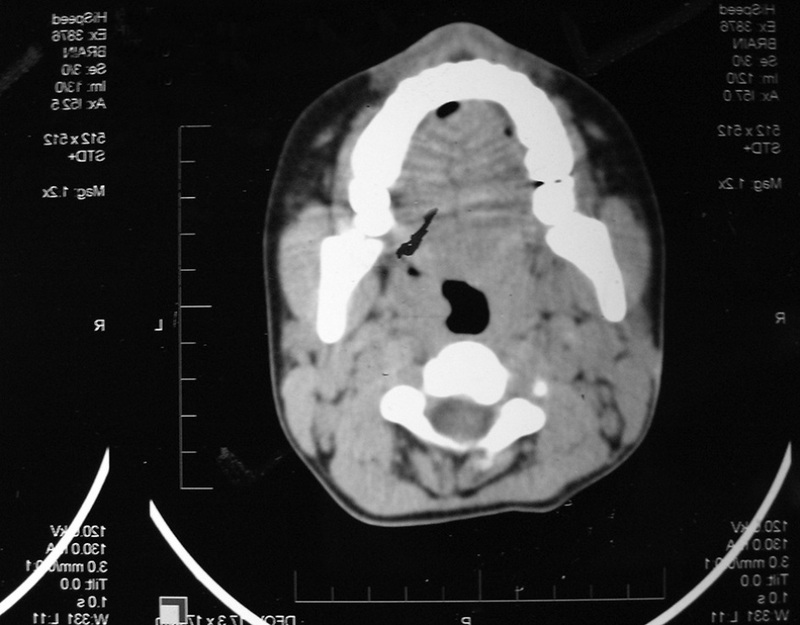 Dermoid cyst of the floor of the mouth: A case report. Eur Arch Otorhinolaryngol 2002;259:60-2. 11. Bloom D, Carvalho D, Edmonds J, Magit A. Neonatal dermoid cyst of the floor of the mouth extending to the midline neck. 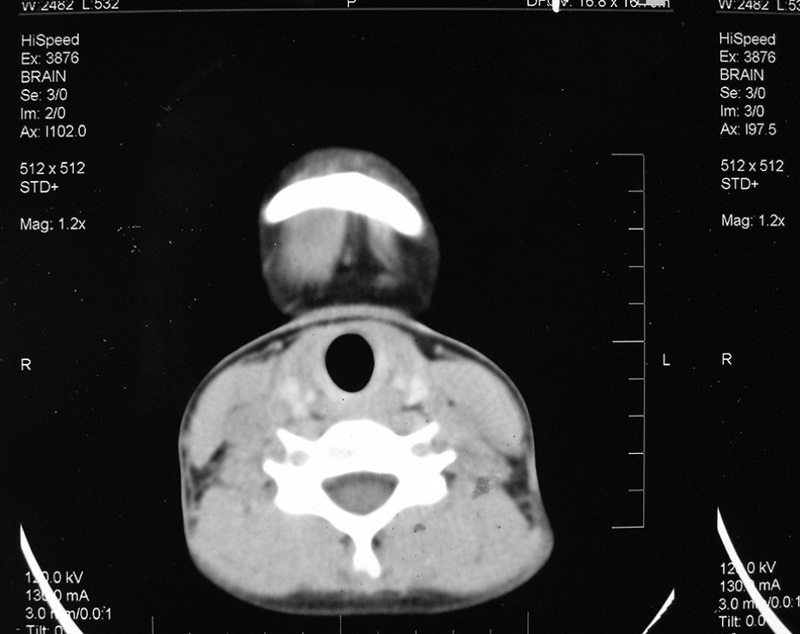 Arch Otolaryngol Head Neck Surg 2002;128:68-70. 12. Lima SM Jr, Chrcanovic BR, de Paula AM, Freire-Maia B, Souza LN. Dermoid cyst of the floor of the mouth. Scientific World Journal 2003;3:156-62. 13. Dimov Zh, Dimov K, Kr′stev N, Kr′stev D, Baeva M, Baeva N, et al. Dermoid, epidermoid and teratoma cysts of the tongue and oral cavity floor. Khirurgiia (Sofiia) 2000;56:30-2. 14. 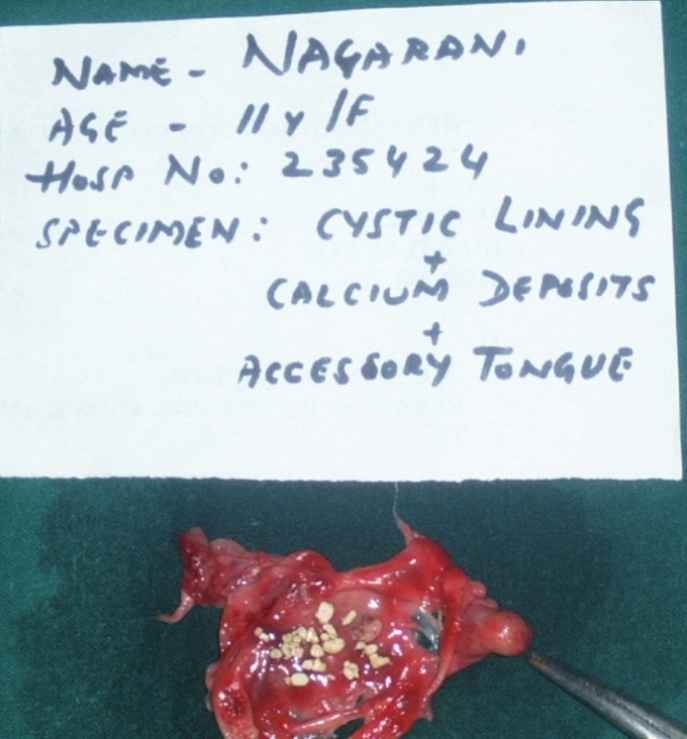 Ege G, Akman H, Senvar A, Kuzucu K. Case report: Sublingual dermoid cyst. Tani Girisim Radyol 2003;9:57-9. 15. Emmanouil-Nikoloussi EN, Kerameos-Foroglou C. Developmental malformations of human tongue and associated syndromes (review). Bull Group Int Rech Sci Stomatol Odontol 1975;35:5-12. 16. Sakuda M, Maeda N, Matsuya T, Urade M, Hasegawa K. A case of tongue anomaly (accessory tongue) (author′s transl). Nihon Koku Geka Gakkai Zasshi 1975;21:609-10. 17. Soldatskiĭ IuL, Sedykh AA, Solonichenko VG, Onufrieva EK. A rare anomaly: An accessory tongue. Vestn Otorinolaringol 2002;3:54-5. 18. Soldatskiĭ IuL, Sedykh AA, Solonichenko VG, Onufrieva EK. A case of an accessory tongue. Vestn Otorinolaringol 2002;3:54-5.